It would be difficult to go wrong by investing in either of these companies over the long haul, but one is likely to present a better opportunity than the other at the moment. If a retailer isn't establishing itself as an online and mobile presence, then it's going to lag its peers and it will eventually fail. Fortunately for Amazon (NASDAQ:AMZN), it's the king of online retail. This fact alone gives Amazon excellent long-term potential. To show proof of its current success, as well as its optimism about its own future prospects, Amazon recently announced that it will add jobs. This might not seem like big news, but if you pay attention to the retail scene the vast majority of retailers are cutting jobs. Most retailers are having a difficult time showing profitable growth because they are conducting heavy promotions in order to drive more traffic to their stores. These promotions hurt margins and the bottom line. Amazon doesn't have to worry about driving more traffic to its stores. While the consumer isn't strong at the moment, many consumers who have stopped shopping at brick-and-mortar locations now shop at Amazon.com. This trend has led to significant top-line growth for the company. Due to this growth, Amazon is adding jobs instead of cutting them. However, this doesn't guarantee that Amazon is a better investment opportunity than Macy's (NYSE:M) at the moment. Amazon added 20,000 jobs in 2013, about half of them for part-time work. Amazon recently announced that it will hire 2,500 more people. This stems from the demand for online shopping. The new jobs will entail picking, packing, and shipping at six of Amazon's fulfillment centers throughout the United States. Amazon claims that the median pay at one of its fulfillment centers is 30% higher than the median retail wage, which puts the pay at slightly higher than $13 per hour. Not bad, especially in today's economic environment. The nationwide average for packers and packagers is $9.57 per hour (Bureau of Labor Statistics). Nevertheless, some people will still complain about the opportunity. Potential employees might want to consider that these jobs also come with health care, paid vacations, quarterly bonuses, stock awards, and matching retirement contributions. Regardless of how potential employees feel about the opportunity, when a company adds more jobs in a difficult economic environment while most retailers are laying off workers left and right this demonstrates strength. There is no doubt whatsoever that Amazon is a long-term winner. There are only two real negatives for investors. One, can Amazon show sustainable profitable growth in the future? Hiking the Amazon Prime subscription price by $20 could help in this regard. Two, Amazon is currently trading at 606 times earnings, which makes it expensive and susceptible to gap-down moves if bad news were to come out and surprise the Street. Does Macy's present a better opportunity? This might surprise you, but while Amazon has enjoyed stock appreciation of 87% over the past three years Macy's has been even more impressive, as it has delivered stock appreciation of 136% over the same time-frame. Some investors think that all department stores will eventually fail because consumers will stop visiting malls and shop more frequently online. This is exactly why Macy's invested heavily in technology back in 2010. It's now reaping the rewards. You might have read that Macy's is cutting 2,500 jobs, or 1.4% of its workforce. That's accurate, but what isn't often reported is that Macy's is adding positions to help support its online growth. In fact, when everything is said and done with job cuts and job additions, Macy's will remain where it was before it announced those job cuts -- at approximately 175,000 employees. 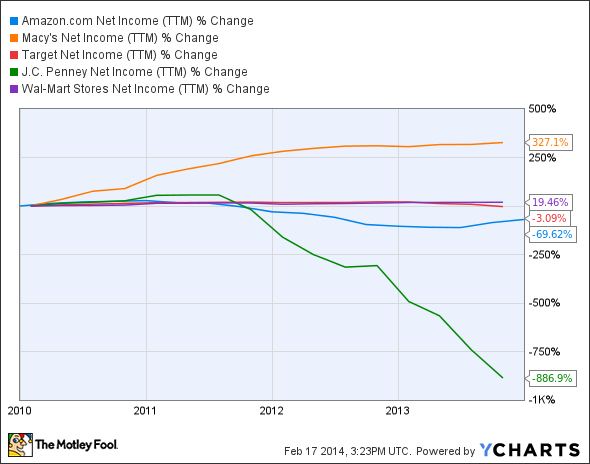 Only Macy's and Wal-Mart have delivered net-income growth over this time-frame. If you want to invest in Wal-Mart, then you will enjoy a 3.10% dividend yield and resiliency to bear markets. Wal-Mart is also trading at just 15 times earnings. However, unlike Amazon and Macy's, Wal-Mart's employee count has seen a net loss recently. Wal-Mart recently announced that it will cut 2,300 jobs at Sam's Club. This cut primarily includes hourly workers and assistant managers, and it will allow Wal-Mart to rebalance its resources. This isn't a major negative for Wal-Mart. This massive retailer is simply trying to figure out a way to improve its operations. With its massive cash flow generation, Wal-Mart shouldn't be bet against. Target and J.C. Penney recently laid off 475 and 2,000 workers, respectively. Target offers differentiation by targeting middle-to-high-end consumers who seek discounts in a clean and comfortable shopping environment. Therefore, the company should be OK over the long haul. However, Target's total data breach costs are still unknown. Therefore, you might want to avoid Target for now. J.C. Penney is cutting costs in an effort to return to profitability, but that's going to be a very long road. Given the retailer's targeting of older consumers, the long-term picture isn't good. In the near term, the company could show improvements in comparison with the Ron Johnson era, but the only way for it to drive traffic is with steep promotions. Therefore, if J.C. Penney is going to find profitability, it will likely have to become a much smaller company. Most investors prefer growth stories. Amazon is adding jobs while most retailers are cutting their head counts. This is a positive sign for Amazon. However, while Amazon's long-term growth prospects are excellent, the stock is expensive and investors now demand more consistent profitability. Macy's has established itself online, it has been consistently profitable, it offers a dividend, and it trades at an enormous discount to Amazon. Please do your own research prior to making any investment decisions.